A screening of the documentary She Started It!, about female entrepreneurs, included a panel discussion. 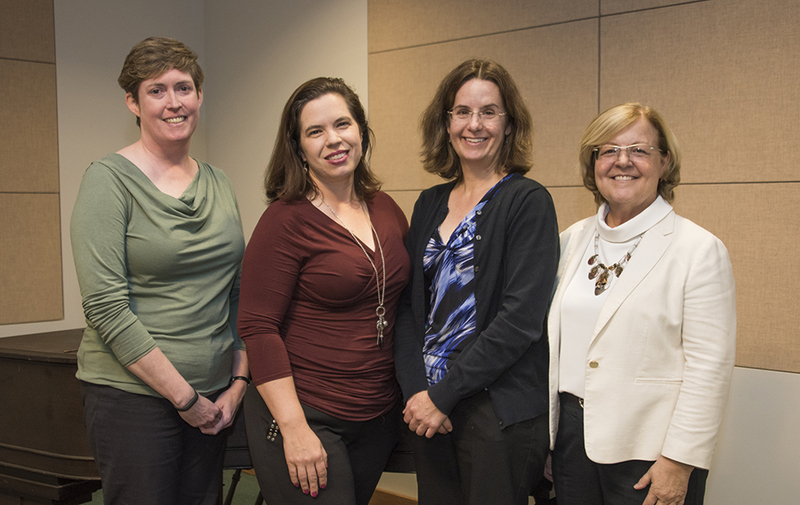 The panelists were CSUN biochemistry professor Karin Crowhurst, University of Southern California media arts and practice professor Tania Mulry, CSUN biochemistry professor Paula Fischhaber, and entrepreneurial engineer Carolyn Casavan. 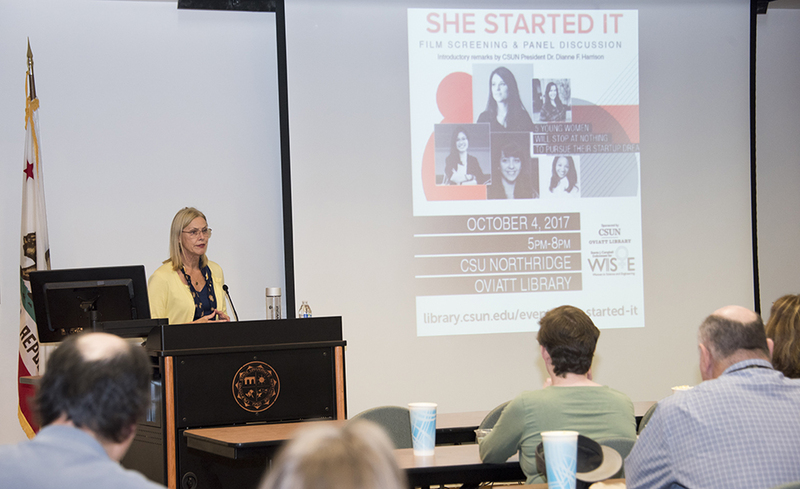 California State University, Northridge President Dianne F. Harrison spoke of the need to inspire women and girls to pursue careers in STEM fields and entrepreneurship at a screening of the documentary She Started It! in the Oviatt Library. The screening of the documentary She Started It! was presented by the Oviatt Library and the Bonita J. Campbell Endowment for Women in Science and Engineering (WISE). 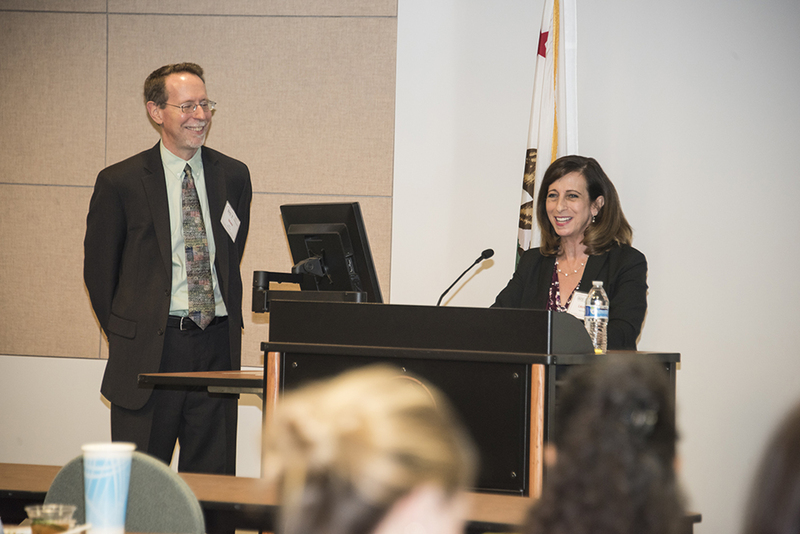 Mark Stover, Dean of the Oviatt Library, and Laurene Abato-Earwood, chair of WISE committee, spoke at the event. As they reached for the sky, the female technology entrepreneurs shown in the documentary She Started It! fought the gravity of societal norms and pressures. In the film, which screened Oct. 4 in the Delmar T. Oviatt Library of California State University, Northridge, the protagonists are shown dealing with: the discouragement of girls from pursuing careers in technology and entrepreneurship, a lack of allies in the male-driven world of venture capitalism, and leadership systems that tend to undervalue the traits women can bring. CSUN President Dianne F. Harrison applauded the film for celebrating creativity and innovation in the field of technology and innovation, and highlighting the important role women have played in spite of significant obstacles. “CSUN is a catalyst for broadening the pool of talent and changing culture so that everybody has equal opportunity to succeed, and everyone’s contribution to progress is recognized. Sadly, women continue to be hindered and their stories untold, especially in the fields of technology, engineering, and innovation,” Harrison said. She added that films such as this, and universities such as CSUN, help ensure that the future of innovation is enhanced and expanded by fully utilizing the talents of everyone who is motivated and persistent regardless of their gender, skin color or economic background. The event was presented by the Oviatt Library and the Bonita J. Campbell Endowment for Women in Science and Engineering (WISE). After the film, a panel of women with entrepreneurial and science, technology, engineering and mathematics (STEM) successes reacted to the movie’s themes and shared their own experiences of triumph and challenges. The panelists—entrepreneurial engineer Carolyn Casavan, CSUN biochemistry professors Karin Crowhurst and Paula Fischhaber, and University of Southern California media arts and practice professor Tania Mulry—emphasized that women can bring valuable differences to enhance male-dominated fields, but if they want to lead in the same style as men, that should be OK, too. In addition to Truong, She Started It! highlighted entrepreneurs such as Stacey Ferreira, who was in high school when she co-founded MySocialCloud, which attracted the attention of Virgin magnate Richard Branson, who helped them secure $1 million in seed money; and Sheena Allen, whose mobile app company Sheena Allen Apps hosts six apps and has millions of downloads. The film’s protagonists are shown mastering the tightrope walk of acceptable behavior for women pitching ideas to men in the business world: be approachable and likable, hold your own—but don’t be too assertive. Truong and Ferreira are shown dealing with high-publicized failures, then deciding to start again. Mulry, a founding member of the MasterCard Worldwide’s Information Products and Services team whose contributions continue to yield the company more than $45 million annually, agreed.